What Does Yellow Rattle Look Like? I’m often asked about Yellow Rattle, Rhinanthus minor. It’s an attractive annual wildflower, good for bees, and which used to be common. Farmers didn’t want it in their meadows, however, as it parasitises grass and reduces its vigour. This makes it invaluable in establishing wildflowers in an existing sward, particularly where the grasses are vigorous and aggressive. I’ve written about it before extolling its virtues and explaining establishment. with relatively fertile soil and well established vigorous grasses. The grass without Rattle has already formed a thick sward up to two feet tall. The area next to it which I seeded with Rhinanthus last autumn looks quite different. It had the same grasses and the same soil. The grass doesn’t look diseased or unhealthy – it’s just much reduced in volume and in size, to a height of about 6 inches in this case. We sell Yellow Rattle seed through our sister website BritishWildflowerMeadowSeeds.co.uk. We have some meadow areas in our field here. They’re now just starting their third year, and coming on nicely. We’re using them to show off some of the different seed mixes we sell, so they’d better do well! One thing many people don’t do is to keep their meadows cut short over the winter. If you want a tussocky look with a lot of grasses – great for voles, thence raptors – that’s one thing, but for a “traditional” hay meadow look you need to cut it short. And keep it short until the spring. Your medieval farmer would have taken the hay cut then have livestock in the field for most if not all of the winter. Hooves pushed seed into the mud and the grass was nibbled low. I use a sit on mechanical sheep to achieve the same effect. Keeping your meadow like this in winter not only makes it tidy, but also allows sunlight to reach the perennial wildflowers. These typically form low lying rosettes which aren’t harmed by cutting, even very tightly. Most over-wintering insects, eggs and larvae are unharmed too, particularly as we do leave areas around the margins which we will only cut every 3 years in rotation. Mowing also gives wildflower seeds a chance to germinate and flourish. I’m thinking particularly of Yellow Rattle, which is an early germinating annual. It’s also true that removing the cuttings will reduce fertility. If we didn’t cut our meadow areas like this the grasses would take over and we would lose the diversity and colour wildflowers bring. It’s difficult making money out of wildflower seeds if you produce them properly. It’s risky, highly seasonal and difficult, and people don’t pay enough for seed as they don’t for plants; they can buy imports much cheaper. Much of the seed in wildflower seed packets is European (and sold sale or return), like most of the “native” hedging sold in the UK. People are now terribly confused about what a “wildflower” is; I know a lovely meadow full of North American wildflowers. Lovely, but not what I’m after, which are the sort of flowers you might find in a a traditional hay meadow, for example, supporting an attractive British ecosystem. No-one seems to know how big the market for British wildflower seed in the UK is; Kew recently commissioned a piece of market research which came up with a resounding blank. I think there are maybe only 5 proper producers here, and lots of smaller folk who harvest meadows and sell that seed as a direct harvested mix. The industry doesn’t produce much wildflower seed in total, particularly in a year as bad as this. To give you an idea, I’ve been wrestling with a shortage of Yellow Rattle. Rattle is an interesting plant and an interesting indicator of how big the market is. It’s almost an essential for meadow creation, for reasons I’ve talked about before. If you were to sow it in an existing sward you’d do so at something like 0.5g per square metre, or 2kg per acre. I reckon there were only about 400kg harvested in the UK this year, enough for 200 acres. Nationwide. The problems with imported seed are twofold. As I’ve already mentioned, it means that people get confused between wildflowers and British wildflowers, regardless of where they’re produced. The “British” species that are sold might also be quite different from the flowers we have. Local populations of plants in the wild here look very different, let alone plants grown from Serbia, for example. It seems worthwhile trying to preserve local variation in our flora which leads to ecologists sometimes specifying locally harvested seed or green hay. This isn’t very helpful from the point of view of UK seed producers, ironically. 1. Our seeds are high quality (test them like we do, and advertise the fact). 2. When you buy our seeds you get what it says on the packet. 4. …harvested in the UK. 5. You will need to pay us properly to produce them. They also need to find ways of making their businesses more profitable. How you cope with being frantic for only three months a year I’m not sure. Harvesting and processing seed is difficult too; you need expensive kit with low utilization rates. Selling directly to small retail customers is probably not the way to go as it’s so time consuming. Rather than spending hours on the phone talking to consumers who need assurance or advice, perhaps use how to videos and online guides. Improve and expand your relationships with selected – not all – resellers (like us!). As we are harvesting Yellow Rattle Rhinanthus minor seed it seemed like a good time to write about it. Yellow Rattle, or Hay Rattle, or Cockscomb, is an attractive yellow annual wildflower of meadows. There seem to be at least 6 different subspecies of it in the UK, which makes its appearance very variable. Rattle is widely distributed across the country, however. It’s a good bumblebee and butterfly plant, flowering in June then rattling in the wind, traditionally telling you it was the time to make hay. Farmers, however, don’t like to see it. Yellow Rattle gets some of its nutrients from surrounding plants, particularly grasses*. As a hemi-parasite farmers regarded it as an unwelcome weed. It can reduce hay yields by up to 50%. Eyebright (Euphrasia) does a similar thing. Rattle doesn’t make the grass look sick, but just enfeebles it. It’s less thick and shorter. This provides obvious benefits if you’re trying to establish a wildflower meadow. That’s particularly so in an existing sward or on a site with medium soil fertility. This can be tricky, even with retiring meadow grasses. Adding Yellow Rattle will give the wildflowers a much better chance. They will have more sun, more water and less competition generally. Further, once the Rhinanthus plants have died back – which as annuals they do in late summer – they leave gaps for other wildflowers. Rattle seed needs to go through a prolonged period of cold before it will germinate, so must be sown in autumn or early winter. It has a limited shelf life, so seed from the current harvest is best sown in the same year. 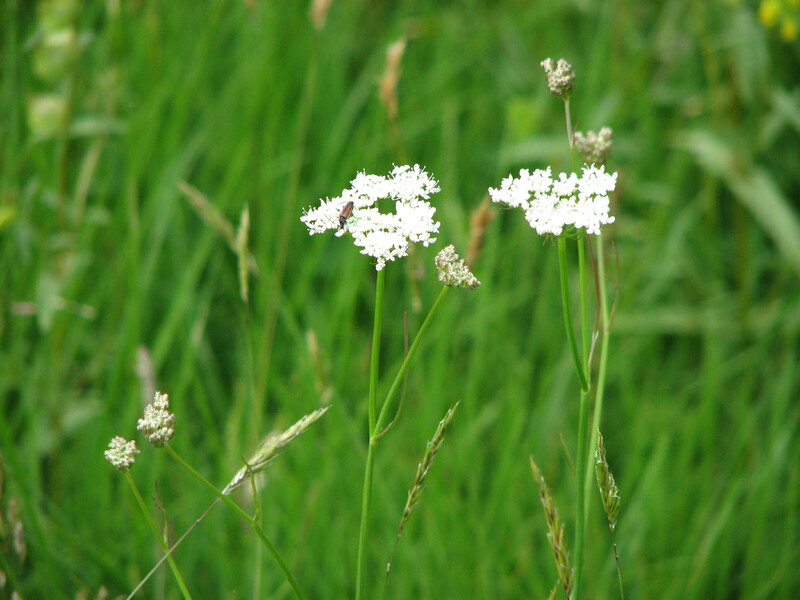 This trait in an annual means that it’s very easy to get rid of it; just mow in May/June before it sets seed. This is why it is so much less common than it used to be in grassland. If you sow a general meadow mix in spring which includes Rattle, it’s worth buying extra in the autumn to add to it. If your site has existing grass it is important that you scarify or chain harrow, and then cut or grazed as short as possible before sowing the Rattle. Keep grazing or cutting to below 2cm throughout the winter (sheep are best for the job) after sowing, and throughout winters thereafter. The seedlings start growing in early spring, so make sure you don’t chop their heads off! We recommend a sowing rate for Yellow Rattle of between 0.5 and 1g per square metre. We can sell you seed down to 250g, or smaller quantities down to 20g through our sister website www.BritishWildflowerMeadowSeeds.co.uk. If you don’t buy the seed through us do make sure you source it from another reputable seller. One of the reasons it’s expensive is that it’s difficult to process and, consequently, its germination rates can vary enormously. As we’ve said, it also has a limited shelf life, and shouldn’t generally be supplied or used 6 months after harvest. As Rhinanthus parasitizes grass, sow it with grass seed or into an existing sward; don’t try to establish it in a seed tray. After sowing, lightly roll or tread the seed in to ensure good contact with the soil. Yellow Rattle seeds are light and wind born, so this is particularly important. If you are using Rattle as the first step towards establishing a wildflower meadow from an existing sward, add plug plants or wildflower seed to the site in the second year. Your chances of success will vary according to which grasses you have and how fertile the soil is. You may well find wildflowers already in the grass, which show themselves with your new regime. It’s really important to cut or graze your meadow area every year from late summer to March. Rhinanthus seedlings need short grassland in the late winter to compete. Be careful not to chop the Yellow Rattle seedlings’ heads off as they emerge, though! So now you’ve done everything we recommended in Part One to make your own wildflower meadow. You have sown your seed/planted plugs/laid wildflower turf. Whichever tactic you’re using, there are two super-mission-critical guidelines to follow when establishing and managing your meadow area. One: if in doubt, use common sense; ask yourself what happens in nature and mimic it. Two: don’t prevaricate. After you’ve done your preparation, you will have sown/planted. AFTER YOU’VE DONE YOUR PREPARATION. You’ll have chosen appropriate species to use, as per Part One, but let’s have a bit of a recap. “Appropriate” means appropriate for what you want out of them as well as their appropriateness for the geology and characteristics of your site. “Appropriate” also means carefully sourced British native plants. Most folk buy pre-determined seed mixes, which have been put together from individually sourced species, or they buy mixes with variable content which have been direct harvested from donor sites, like our Dorset seed mixes. I’m increasingly thinking this is the way to go. For specialised or large scale projects we’re often asked for bespoke mixes which have been put together by landscapers or ecologists. If you’re not going to source your plugs or seeds through us, source them through a supplier whose plants are locally and ethically sourced. There’s no kite mark in the wildflower plant business – I wish there was – so this is the only real guideline you’ve got. As you can imagine, the extra cost of small scale production means it’s not the cheapest thing in the world, but often buying cheaper mass produced seed is a false economy as germination rates can be much lower – if it hasn’t been freshly harvested, for example. What’s worse is that these mixes often include non-native plants and can look a real mess. If you’ve seeded your meadow you will notice some seedlings will put on an impressive sprint, but please please remember that almost no perennial will flower in its first year of establishment. Some won’t even germinate! It’s an enormous disappointment to many punters that their wildflower meadow looks so green and/or barren to begin with. They just notice a few blades of grass. In a sense, the less growth there is initially the better if it means poor fertility soil. This will lead to more diversity. If you want colour, add some annuals into the original mix so you can get vibrant blues, reds and purples tout suite. Most meadow seed mixes do include one annual – Yellow Rattle – a bit of a star whose merits I discuss elsewhere. If you’re planting plugs it’s pretty straightforward; again, just make sure plug plants don’t have to compete with grass when they are getting established. We recommend 5 per square metre. Whether you’re sowing / planting in autumn or spring, you can slip into your annual maintenance regime straight away. Traditionally meadows were cut as soon as the Rattle went to seed in midsummer. Although this will give you nice hay, most of our clients are more concerned with the look and/or ecological value of their meadow areas. If you are, ideally, cut in sections from the end of July. If you can only give it one go, wait until mid August. The odd Knapweed will still be in flower. Whenever you do cut it, and whatever you cut it with – scythe, topper, automatic scythe, lawnmower set to its highest level – you must take the hay off. It’s the easiest way of reducing soil fertility, which is a constant battle – less fertility, more flowers, fewer weeds and less aggressive grasses. You can use the hay to seed different areas too, by just spreading it around on the bare soil. Over the winter keep your wildflower meadow tidy; if you’ve got sheep they’re the perfect lawnmowers. Otherwise, mow every month or so. Obviously, leave it to grow again from early spring, when things are starting to stir. It does pay, though, to establish paths through your meadow area even if it’s not a thoroughfare – if you’re anything like me you’ll want to mooch about it of a summer’s evening getting a close up view of what’s going on. They will also make your meadow look like more of a deliberate feature. However careful you are and however poor you soil is you WILL have problems with perennial weeds. I know one man’s weeds are another’s wildflowers, but dock, nettle and thistles are very invasive, whatever their merits, and I wander around during the summer hoicking them out. Assuming the soil isn’t too fertile they will give up the ghost soon enough IF you weed them out BEFORE they set seed! If grasses start to dominate the wildflower meadow, add more Rattle in the autumn. If new plant species start appearing over time, excellent. Your meadow won’t just change colour during the seasons, it will develop as it adapts to the local environment. I even met a hedgehog marching about last night – only the second time I’ve seen one here in ten years – which got me nearly as excited as the dogs. Richard sowed both the cornfield annuals you can see here and also our clay soil meadow mix, and is creating a really nice natural area in his garden, with mown paths a la Little Dixter winding between the trees. Looking at some of his other photos the Rattle in the mix seems to have taken, which will be the key going forward. As for us, we’ve been busy again at Archie’s meadow. Mowing it a week or so ago and strewn the hay about Archie has rather brilliantly baled it, saving us a load of work. This bale must be worth a few quid – there’s still a lot of seed in it, albeit mostly annuals – or he could use it to seed a new area. We scythed the last strip of meadow, which took no time at all, and it’s all looking very well set for a meadow approaching its first anniversary. We’ve learnt several useful lessons over the last 12 months, not the least being the virtue of patience while waiting for the perennials to get established. I don’t think we’ll cut it through the autumn, so we will get another flush of annuals next year as there’s still plenty of bare ground for them to get established on. I’ll keep an eye on it over the next few months to see which emerging perennials I can spot, and do the odd bit of weeding. In the meantime all we’ll do is spray off a very thistly section of the field margin to keep them seeding. In contrast we’ll cut the meadow here (now in its third year) in a little while – rather later to let some of the later flowering species like Knapweed and Bedstraw go to seed. When we do I’ll use my scythe rather than anything mechanical to avoid doing any damage to the fauna, including my new hedgehog friend. a “nurse” of annual wildflowers. The other section looks much less ostentatious, but is now going nicely too. It is a mix of perennial wildflowers, Yellow Rattle and grasses from Julian at local supplier Goren Farm. Although Archie has cut most of the area we’ve left a strip of this mix for a few weeks longer. In addition to some interesting grasses and the Rattle, even this duffer botanist could see lots of plantains, Hawkbit, Fleabane, Red Clover, Sorrel, Yarrow, and Buttercup. I’m sure there’ll be a lot more species I haven’t spotted. Very encouraging, very easy – and to think I was worried about it a couple of months ago… We’ll clear the hay off the rest after a few days so that any seed in it will have chance to drop to the ground. Another post on meadows – sorry, but it’s that time of year and you can’t say too much about meadows. “Meadow” would be a bit of a stretch to describe the area which we’ve been experimenting with over the last 9 months. It’s about 30m by 13m (mini-meadows can be a lot smaller), and started off as being part of the pasture in front of the house. It would have been an eyesore had we started off by stripping off the top soil or spraying the existing sward, and the grasses were too varied and interesting to lose in any case. Steve Alton recommended grazing and chain harrowing in the autumn, which we did. You can see how it started here. We then sowed LOADS of Rattle, and kept the sheep on the area over the winter to push the seed into contact with the earth as they marched about. I should say that this was all very high risk as I knew we had people coming to two one day courses in meadow creation and management in June the following year – i.e. last weekend. Anyway, thank goodness it has worked. We now have a sea of Yellow Rattle and, very obligingly, a single plant of a relatively rare native species, the catchily named Corky-fruited Water Dropwort. Andrew George tells me it can last some time in a sward without flowering and is indigenous to these parts, so there may be other plants out there in the rest of the field. Along with the Bumblebees – who love Rattle – I also spotted our first Meadow Brown today – I hope we have as many this year as we had last. It gives me the greatest pleasure seeing these colonial species, knowing that we have created the right habitat for them to live and multiply in. 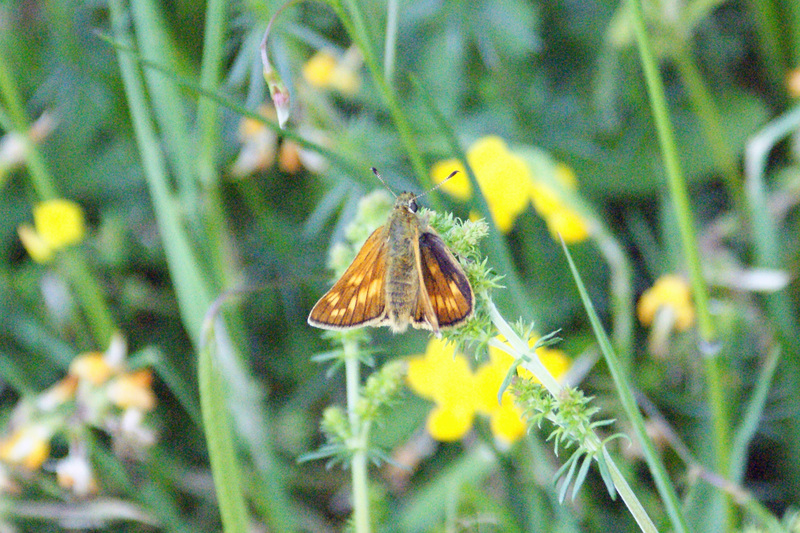 Andrew made the same point during our meadow course last weekend, where among other butterflies we saw Large Skippers on a site he has designed at Carymoor. I’m hoping we’ll have some here this year; on our existing meadow area we’ve got Cocksfoot as one of our grasses for the larvae and loads of some of their favourite nectar plants, including Bird’s foot Trefoil, Yarrow and Knapweed. Anyway, back to Caroline’s mini-meadow. Once the Rattle has set seed we’ll cut it and let the sheep back in until autumn (I’ll put a little fence around the Corky-fruited Water Dropwort so it can seed later on, doubtless to general hilarity). Come autumn and we will sow a pure widlflower mix into the areas where the Rattle has been most effective in reducing the grass, or use seeds collected from another area. It has been a simple and effective way to start a meadow area without losing our existing grass or stripping the topsoil off. Just the sort of thing our tutor-in-chief Sue Everett would approve of. Phew. Thanks Steve. Hurrah! I can now make out the Yellow Rattle (Rhinanthus minor) seedlings in our meadow areas here. Rattle is particularly important for us as our soil, though unimproved, is pretty good, and without it the grasses would run amock and crowd out any perennial wildflowers. We’re lucky though in that we don’t have too many bullies like cocksfoot or ryegrass, which would be a struggle for it, and consequently I was amazed at the pretty much instantaneous effect it had when we introduced it. As a non-botanist, Yellow Rattle seems as odd as it is helpful. Rattle is semi-parasitic – it attaches itself to the roots of grasses in particular – and the reduction in vigour of the surrounding plants is marked. It must have been a plague for farmers in the past, but for establishing and managing diverse meadows it’s really helpful. Rattle seeds need to be cold over a prolonged period (“stratification”) before they can germinate, so you can only sow them in autumn – unless you find someone who has kept a supply in a chiller over the winter. The seedlings start to grow early in order to get as much light as possible before the surrounding grass starts to get going, but when they get to a certain point will conk out unless they can find plants nearby. Bumblebees in particular like its rather beautiful flowers, which appear in June. It sets seed promptly, which explains its other common name, Hay Rattle; traditionally, once you heard its rattle it was time to take a hay cut. As it’s an annual and the seed isn’t viable for long, if you mow in late June for a couple of years it will disappear. I’m still understanding how best to establish Yellow Rattle populations, which is a bit hit and miss. The best solution seems to be to wait for a season after sowing a meadow mixture and then sowing it seperately, when there are enough plants around for it to parasitize but not so many to crowd it out. We’re currently running a trial on a mixture with a lot of Rhinanthus in it which was all sown last autumn, and it’s looking a bit dodgy… Anyway, you’ll find a lot more rattle about Yellow Rattle in our main website.